Marinette Marine Corporation (MMC), Fincantieri’s US subsidiary, and Boeing have announced that Oceaneering International are to enter the team set up a year ago with a view to competing for the imminent tender for the “Ship-to-Shore Connector” (SSC) program which provides for the construction of 80 new generation hovercraft for the US Navy. The announcement came today on the eve of the opening of the “Navy League Sea-Air-Space Exposition” in Washington, the most important fair in the air-sea defense sector where Fincantieri has a stand as Fincantieri Marine Group, which is responsible for the Company’s activities in the USA. Prime contractor for the team is Marinette Marine which will build the hulls while Boeing will build the propulsion, communication and control systems and the new partner, Oceaneering International, will bring its consolidated experience in the maintenance and assistance of vessels now in service and scheduled for replacement. By integrating their expertise in their specific fields, the three companies are in a position to offer the US Navy latest generation vessels which guarantee high technical reliability at relatively contained costs. 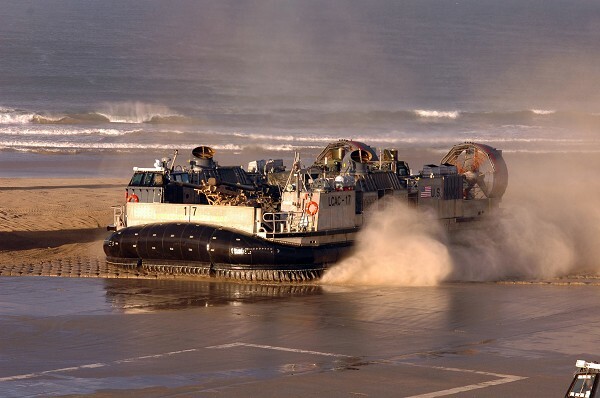 The 10-year SSC program provides for the construction of 80 hovercraft, for a total value of approximately 4 billion dollars, which will replace the Landing Craft Air Cushion (LCAC) currently in service with the US Navy and purchased between 1984 and 2001. Constructed as hybrid platforms similar to an aeronautical product, the vessels are supported by an air cushion and have one or more propellers. Able to move over a range of different surfaces – for example sand, ice, mud and marsh – at high speeds of over 40 knots the boats can be deployed for military purposes such as landing craft for transporting up to 70 tons of vehicles, troops and equipment from ships off shore.